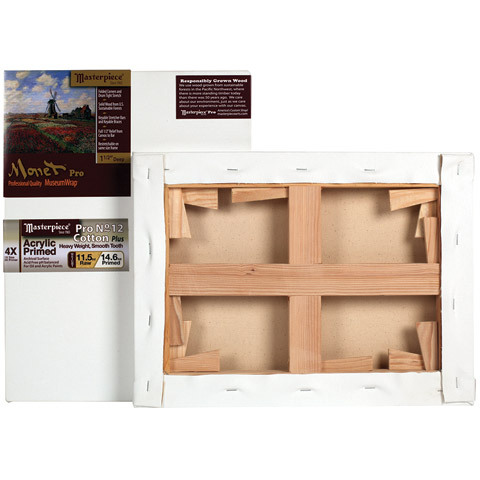 This canvas features a 1-1/2" profile with a 1/2" lip which keeps the canvas positioned high above the bars to prevent lines and indentations. The key-able cross bracing on canvas sizes 20" x 20" and up offer additional strength, stability and warp resistance. This canvas has a heavy-weight surface, and weighs 11.5 oz. raw and 14.6 oz. after priming. It is great for aggressive painting techniques and heavy paint applications, and suitable for use with acrylic, oil or alkyd paint. An extra primer coat provides a smooth painting surface. Stretched using MasterWrap technology, this canvas offers a drum-tight archival surface that can be further adjusted using the pre-installed corner and brace keys. Folded corners and extra canvas selvage allow for re-stretching, and the clean staple free edges are great for display without a frame. The solid, finger-joint free, kiln-dried bars are milled with lumber harvested from sustainable forests in Oregon and California. GR items denote sizes based on the Golden Mean, considered to be the most pleasing rectangular shape to the human eye. Turner, Seurat, Rembrandt, Michelangelo, Da Vinci and countless others have historically used this proportion in their compositions.